JIGGING RAINBOW SMELT WITH A SABIKI RIG !! TOM AND I WOULD LIKE TO SAY THANK YOU TO THE L. L. BEAN COMPANY ! THE JIFFY PRO 4 PROPANE POWERED ICE AUGER..
ICE FISHING, GOOD BREAKFAST AND A BALD EAGLE…S/O TO LEE ROBINSON, MY BROTHER.. This podcast is a production of Jack Mountain Bushcraft Media. The Working Class Woodsman may or may not be a guest in this particular podcast episode and is not responsible for the content (especially for anything he might say when he's a guest). Recorded right after we got back from our trip to northern Quebec where we spent a week immersed in Cree Culture. Living in a traditional shelter on the side of a lake, we learned about hunting, trapping, snaring, fishing with gill nets as part of learning about traditional northern life ways. In the podcast we talk about the difference between skill and culture. With me on the show are Ben Spencer and Christopher Russell. 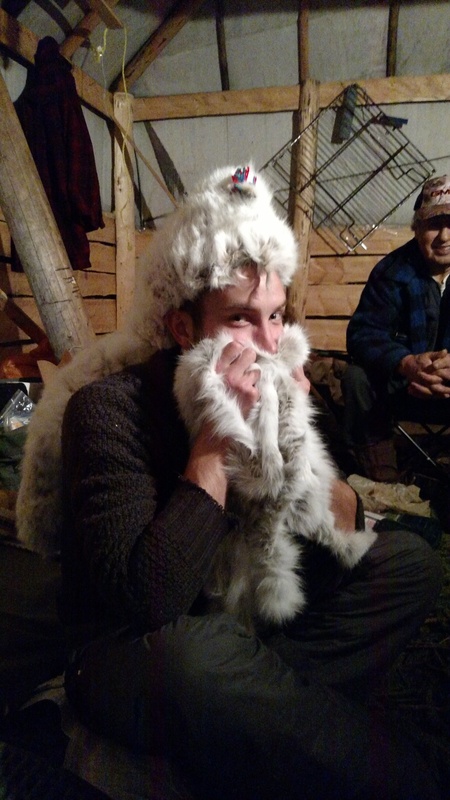 PHOTO: Chris wearing a rabbit skin jacket and rabbit skin beard in Quebec. PHOTO: Self Reliance Workshop on wild foods from summer, 2016. For episode 17 I spoke with Josh Arnold, the director of Global Awareness Local Action (GALA). GALA is a local non-profit we partner with for our self reliance workshop series, among other things. We were also joined by Christopher Russell. We talked about the history of GALA and the self reliance workshop series as well as how we’re expanding it in 2017. Episode 16 of the Jack Mountain Bushcraft Podcast is all about the role of crafting in bushcraft and education. Making things with your hands is a big part of our educational programs. I’m joined by Christopher Russell for a discussion about crafting as an educational tool, our experience with crafting during semester courses, and some of the benefits we’ve seen as a result of crafting. Along the way we lay out some of the whys and hows of making things, as well as the motivation for doing so. We mentioned 2 books during the podcast. Just before they left on the Wilderness Canoe Expedition Semester, I sat down with Raife Bowman, Dylan Robinson and Jeremy Yates to talk about their recent hike across Quebec and New Brunswick on the International Appalachian Trail. They used their homemade pack baskets to do the hike, and had some adventures along the way. Listen as they tell their story. You can connect with Raife (as well as Dylan and Jeremy) at Raife Bowman Bushcraft – https://raifebowmanbushcraft.com/. At the end of week 6 of the spring semester I recorded the second podcast with Christopher Russell. We talked about the progression of the course, the instructor and guide’s dilemma, the 2 journeys (outward and inward) that everyone is on, and told a few stories along the way. You can read more about Christopher, including an amazing series of interviews he published about the other folks on the course, at his site Primitive Addictions. Christopher Russell is the first recipient of the Wilderness Bushcraft Semester scholarship and a student on the spring, 2016 WBS. We sat down to talk about scholarships, motivation and all things WBS on a cold day in early May.